Charles Culliford Boz Dickens was the first child of novelist Charles Dickens and his wife Catherine Hogarth. His family called him Charley. He was educated at Eton and studied business in Germany. In 18 he started to work for Barings Bank. After the marriage of his parents broke up he lived with his mother. In 1861 he married Bessie Evans, the daughter of Dickens former publisher Frederick Evans. They had eight children. After his business failed Dickens contracted him as sub-editor for "All the Year Round". Soon afterwards his father died and he became its owner and editor. He published several dictionaries on his father. 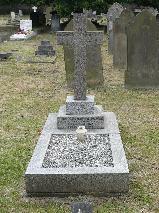 He died in 1896 and was buried on the same day as his sister Mary. The grave of Charles Dickens the Younger at Old Mortlake Burial Ground, London.